in all the busyness of preparing for our trip, valentine’s day has fallen to the wayside for James and me. it’s not a holiday we go all out for under normal conditions anyway, but it’s really gone on the back burner until James asked me yesterday what I might want. I’m still undecided (I want something luxurious looks-wise but economical price-wise since we’ll be traveling), but I ran across baublebar‘s monogram collection on their website and am toying with the idea of picking a personalized necklace. 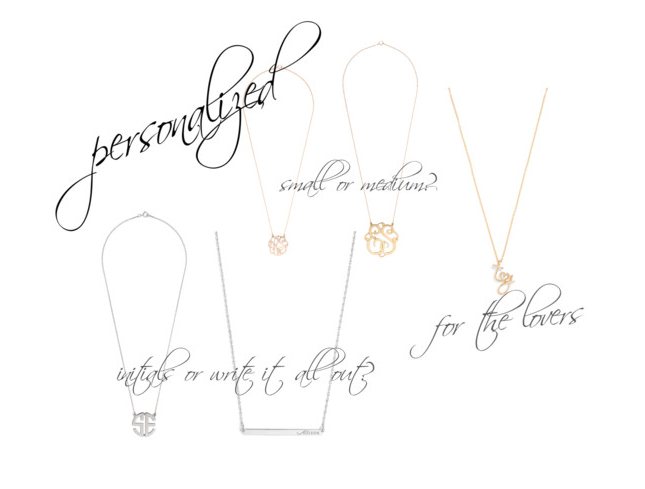 there’s this cute one with the option of picking your initial and your loved one’s for a little romantic bling; there’s this ribbon print one that I can’t decide between the medium or small, and then there are these ultra modern block initial necklaces or the equally chic bar pendant with your whole name written out flushed to the right. I’ve definitely pinned all three options…if they don’t get picked for this Valentine’s, there’s always my birthday or our anniversary.